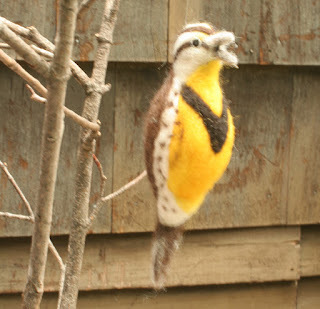 Here's a meadowlark I made for someone on Etsy. I was so glad she asked for it, because it's not one I would usually choose, since I don't know it (haven't seen it or knowingly heard it). I really enjoyed the challenge of making a new bird. 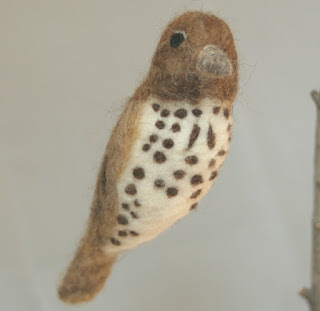 Yesterday at market a customer asked whether I had a wood thrush, and I was happy to tell her that I did. In the evening she sent me a link for a story that had been on NPR's Field Notes. It's about the complexity of bird song, especially the wood thrush's. It was fascinating, so here's the link if you'd like to listen to it. This is the wood thrush I made.